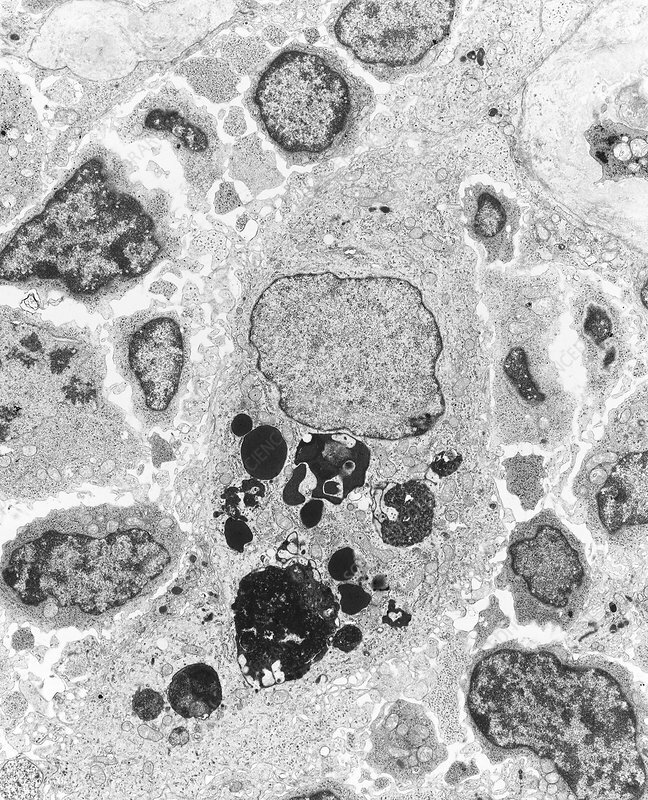 Transmission electron micrograph of a macrophage from a human tumour. Macrophages are large scavenger cells which form part of the body's defence system. Their most important function is the engulfment and digestion of invading bacteria, viruses, protozoans, and of cells and cell debris resulting from inflammation or damage. Once engulfed, material is enclosed within single- membraned vacuoles called lysosomes, where it is broken down by hydrolytic enzymes. The pale body at the centre of the image is the cell nucleus and the dark bodies just below it are lysosomes of various shapes and sizes. Magnification: x6,000 at 8x10 inch size.